"Ratcliffe’s relentless persistence to unearth the truth by meticulous research and in-depth enquiries is driven by an unprecedented desire to lay to rest the terrible sadness and feelings of guilt surrounding that fateful night…The book reads like a detective thriller in places, as he delves deeper and deeper into the quagmire of what some may see as lies and deceit, to eventually unravel the mysteries of that season and shed a very different light on what many thought was an unfortunate bit of bad luck. A book that pulls no punches and tells it how it was." "... a welcome addition to the history of mountaineering ... though this is a book that will undoubtedly cause controversy in some quarters, we believe that Everest historians, as well as those on the mountain in 1996, will find it an absorbing read." "FOR heaven's sake," we thought, "not another book on the 1996 debacle on Everest that left eight people dead". However, we are glad we read this latest book... Between us, we have read at least six of the many books about the 1996 Everest deaths, the most famous probably being Jon Krakauer's Into Thin Air. While they all add to the mix, they essentially tell similar stories. Not this one. Ratcliffe's book lives up to its promise... it certainly made us question our opinion of what happened, and of some of the key people embroiled in the saga... Â…By Ratcliffe's account, some of the disastrous decisions of that night were made in the name of securing summits, not safety. That much, it must be said, is generally understood, but Ratcliffe reveals its extent. Written in an easy, eloquent style, all those interested in mountaineering will find it illuminating. Graham Ratcliffe… arrived on the South Col late on the afternoon of the 10th. Oblivious to the unfolding tragedy, his group bunkered down as many fought for survival not far from their tents. Ratcliffe returned to Everest, reaching the summit for the second time in 1999, but continued to be troubled by inconsistencies in various accounts. Galvanised into researching the events leading tp the tragedy to find the truth, he focussed on debunking the accepted view… He discovers important omissions, bordering on deception, in a number of authoritative accounts such as Krakauer’s Into Thin Air and Breashears’ High Exposure. A Day To Die For is an apt title that reflects Hall’s obsession with summitting on 10 May. I found this is a compelling book and it provides greater understanding of the key factors behind the decisions made that led to the tragic events. 'You'd think by now the tragic events on Everest in May 1996 have been dissected in every possible way. You'd think a book from a climber who wasn't on either of the teams central to those events, written more than a decade later, would have little new to offer. 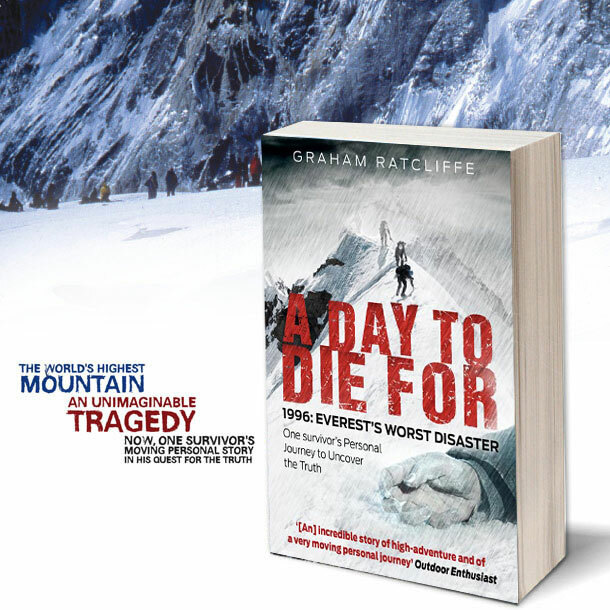 Join author Graham Ratcliffe on an unforgettable journey to the summit of Mt Everest - and to the devastating night in 1996 that took the lives of eight climbers. Shouldering a burden of guilt, Graham sought to find answers to questions about how the tragedy occurred, only to find important findings not made public. Gaining a deeper understanding, his book poses questions about why these facts were not brought to light.